The foot is an intricate structure of 24 bones that form two crossing arches of the foot. The longitudinal arch runs the length of the foot, and the transverse arch runs the width. The ankle joint is formed by the interaction of the foot and the lower leg, and the toes are on the far side of the foot. The bones of the foot are primarily held together by their fit with each other and connected by a fibrous tissue known as ligaments. The muscles of the foot, along with a tough, sinewy tissue known as the plantar fascia, provide secondary support to the foot. The foot has internal muscles that originate and insert in the foot and external muscles that begin in the lower leg and attach in various places on the bones of the foot. There are also fat pads in the foot to help with weight-bearing and absorbing impact. The foot is the foundation of athletic movements of the lower extremity. Pain indicates that there is something wrong with either the interaction of internal structures of the foot or with the how the foot is interacting with external influences. How and when the pain occurs and the locations of the pain are the primary clues to what may be causing the pain. When there is pain, the body reacts by changing the way it moves or functions in an effort to reduce the pain. Biomechanical changes or disease may prevent the normal movement and cause further injury. Foot pain or numbness may be caused by many different conditions or injuries. Many of which can be helped at Connecticut Family Chiropractic. Acute or repeated trauma, disease, or a combination are the most common causes of foot pain. Trauma is a result of forces outside of the body either directly impacting the body or forcing the body into a position where a single or combination of forces result in damage to the structures of the body. Poor biomechanical alignment may lead to foot pain. Wearing shoes that are too tight or high heels can cause pain around the balls of the feet and the bones in that area. Shoes that are tied too tightly may cause pain and bruising on the top of the foot. Injuries to both the skin covering and the internal structures may also be caused by multiple small repetitive traumas. Micro-trauma injuries can be caused by running on uneven surfaces, surfaces that are too hard or too soft, or shoes that have poor force-absorption qualities or fit incorrectly. Repeated overstressing of the same structure of the foot may cause stress fractures, tendonitis, plantar fasciitis (heel spurs), and acute and chronic osteoarthritis. Foot pain may also be caused by Tarsal Tunnel Syndrome. Tarsal tunnel syndrome results from compression of a nerve that runs through a narrow passage behind the inner ankle bone down to the heel. It can cause pain anywhere along the bottom of the foot. The doctoc’s at Connecticut Family Chiropractic have special adjustment techniques for all kinds of foot conditions. The arches of the feet absorb and return force to and from the body to the outside world when we are standing on our feet. 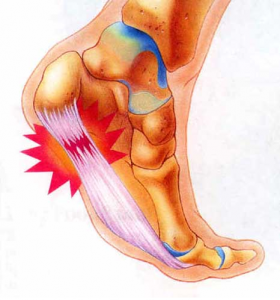 Injury to the plantar fascia is a common cause of arch pain. The plantar fascia is a tough fibrous sheath that extends the length of the bottom of the foot and lends support to the arch. When the plantar fascia is damaged, the resulting inflammatory response may become a source of arch pain. High and low arches (flat feet) may cause pain because of strain to the feet. Footwear can be a contributor to foot pain. Poor fitting shoes in the short term can cause blisters, calluses, bruising and be a source of athlete’s foot. The long-term effects may be bunions, corns, irritation of nerves and joints, misalignment of the toes, and the source of microtrauma injuries to the foot. As in all conditions the first step in treating foot pain is to determine the cause of the pain. Mobilizing the metatarsals, adjusting the toes, and deep stretching and soft tissue therapy of the muscles between and under the metatarsals is extremely effective. Ultrasound, therapeutic exercises as well as chryotherapy may be indicated. Checking for fixations in other parts of the foot are important. They can be adjusted with the help of a Thulitables drop board. Shoe inserts may be very helpful, particularly if pronation of the foot exists.